Colina is a mare with personality. 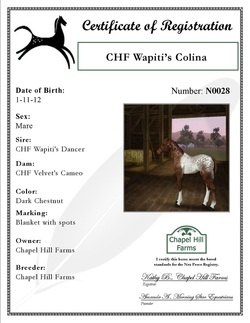 She is a beautiful dark chestnut Nez Perce mare with a blanket and brown spots. Colina loves to jump. We are very pleased with her first foal, Poetry. Striped hooves are found here.